You are at: Home / Agora / Tsipras is at his strongest, but for how long? Tsipras is at his strongest, but for how long? Working out how Alexis Tsipras went from anti-austerity crusader to comfortably winning an election while promising to implement the third bailout, and in the process turning a resounding “No” in the July referendum to a humiliating “Yes” a week later, is something that political scientists will study for years to come. There are many interpretations that can be given: Greeks wanted to continue the process of breaking from the past after cutting the umbilical cord tying them to New Democracy and PASOK in January, or the opposition parties were unable to convincingly explain why it would be preferable for them to implement the bailout rather than SYRIZA. Then there is the issue of Tsipras’s persuasiveness and what role his personal popularity has played in convincing Greek voters to stick with him. All of these factors are worth considering and would certainly be part of any study on the topsy-turvy events of this year. However, let us set aside the speculation for a second and focus on the more tangible aspects of yesterday’s victory. The margin of SYRIZA’s victory was bigger than even Tsipras and his aides would have envisaged. None of the opinion polls in the mainstream media predicted anywhere near a 7.4 percentage point win, which raises a new set of questions about the reliability of these surveys and the methods used to gauge the public’s mood. Nevertheless, the size of the victory is tempered by the fact that there was a record low turnout of around 56 percent, which is 20 points lower than the proportion of voters who cast ballots in the 2004 elections. Also, SYRIZA lost 320,000 votes compared to January. Support for New Democracy was also down by almost 200,000 votes, while centrist To Potami shed around 150,000 ballots. PASOK, which allied with Democratic Left, was the only parliamentary party to increase its number and share of votes. However, it should be noted that the Socialists were aided by the decision of George Papandreou and his Movement of Democratic Socialists, which won 2.5 percent in January, not to run. In these circumstances nobody can truly claim to be winner, especially when the Neo-Nazis of Golden Dawn lost only 9,000 supporters and increased their share even though on the eve of the elections its leader admitted “political responsibility” for the murder of anti-fascist rapper Pavlos Fyssas. Many Greeks decided there was no point in voting because the policies set out in the third bailout means it will make no difference who governs Greece or because they lost their faith in the country’s leaders over the last tumultuous months. This should make Tsipras, who undoubtedly emerges as the only serious political player in Greece at the moment, ponder what this victory means. It gives him the chance to stamp his authority on his party, which is still in turmoil following this summer’s rapid-fire developments. 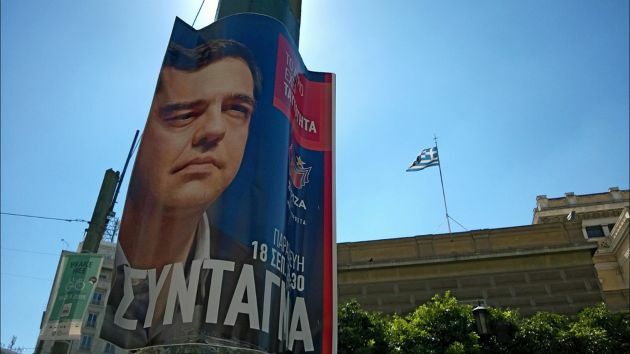 The failure of the SYRIZA rebels who formed Popular Unity to enter Parliament, albeit by a few thousand votes, provides a salutary lesson to anyone within SYRIZA that might be thinking the party needs to reconnect with its radical roots. It is likely that Popular Unity’s failure will make SYRIZA members more receptive to Tsipras’s message. Tsipras also has the advantage of teaming up again with Independent Greeks, his compliant coalition partner since January. The nationalist party will probably be willing to give Tsipras carte blanche in return for certain ministerial posts. This would give Tsipras a free rein to shape government policy. The danger is that after gambling on snap elections in January, with the referendum in July with Sunday’s vote, and ending up on the winning side, Tsipras may start to feel untouchable. This would guarantee his downfall. It’s true that the opposition is demoralised and defeated but New Democracy will surely elect a new leader in the months to come. Potami’s failure may rekindle the discussion about a revival of Greece’s centre-left, with a more buoyant PASOK now able to play a central role in such a discussion. Also, we are unlikely to have heard the last from Popular Unity or some pro-drachma force in Greek politics. It’s also the case that Tsipras has proved to the party that his increasingly authoritarian style is paying dividends. However, SYRIZA’s capacity for intense debating and infighting should not be discounted. The party lives off, and its members live for, the friction generated by disagreements. Tsipras may be returning to power with the acquiescent Independent Greeks leader Panos Kammenos but he proved numerous times over the previous months that he has the potential to embarrass the government. His comments about sending jihadists to Berlin, creating new NATO bases in the Aegean and selling hydrocarbon rights to US companies are just some of the examples that highlight how much of a loose cannon he is. Finally, the prime minister is in a stronger position to implement the bailout as he now has voters’ approval for it, thereby smashing the pro- vs anti-memorandum cleavage that has dominated Greek politics since 2010. However, the history of the Greek crisis tells us that the difficulty is not in getting approval for the measures but in maintaining support while implementing them. Every Greek government has started with a comfortable majority that has been whittled away due the pressure of meeting lenders’ demands. Tsipras’s government will be the first to start with such a slim majority (just five seats), which immediately raises the question of whether it will be able to survive. This time is slightly different in that there are three opposition parties who have already voted in favour of the bailout, meaning that a total of 258 out of 300 MPs will – in theory – support bailout-related legislation. However, this number is more fragile than it seems. If New Democracy comes under new leadership, it could decide to be much more sparing in its support for the government. Equally, Kammenos’s abrasive style (during the election campaign he insisted he would never work with PASOK) could burn the government’s bridges with the other opposition parties. Without the steadfast support of New Democracy, PASOK and Potami, Tsipras will be substantially weakened and at the mercy of the small number of MPs who guarantee his majority. This could be vital when it comes to implementing unpopular bailout legislation, a process that has repeatedly stretched Greek governments to breaking point in previous years. This makes Tsipras’s decision to limit his political cooperation to just Independent Greeks, especially when both parties are desperately short of know-how in terms of running the country, seem short-sighted and perhaps a case of hubris. The time for being humble is when you are at your strongest. When a country loses its ability to direct own fiscal policy and instead passes laws designed in Berlin and Brussels, it is no longer a free country. Greece at the moment suffers from an acute case of German occupation which manifested by the MOU regime. Under such circumstances Tsipras emerged as the undisputed champion of anti-austerity in Europe, soon to be followed by others. The cardinal mistake committed by ND+Pasok+Potami was adopting the language and mannerisms of the occupier. The story of the last 5 years tells us that Greek political parties which side with and amplify the Schauble rhetoric get reduced to ashes in a very short order. Tsipras survived the ordeal because his "capitulation" was a product of black mail seen with a naked eye by the majority of Greek citizens. Therefore the conclusion for what just happened with the Tsipras triumph is that if you want the Greek vote never behave like a German slave. And I mean never. But the real question is this: How long before Schauble's spectacular fall and the austerity nonsense plaguing Europe along with him? My bet is on Schauble falling first and this a strong bet. >"...the history of the Greek crisis tells us that the difficulty is not in getting approval for the measures but in maintaining support while implementing them."